← Recently bought, or a short summertime post. Summer continues, I’m actually starting my vacation tomorrow afternoon, and it’s going to be 2,5 weeks! But blogging requires some regularity, and so I decided to write a few words about a very special book. 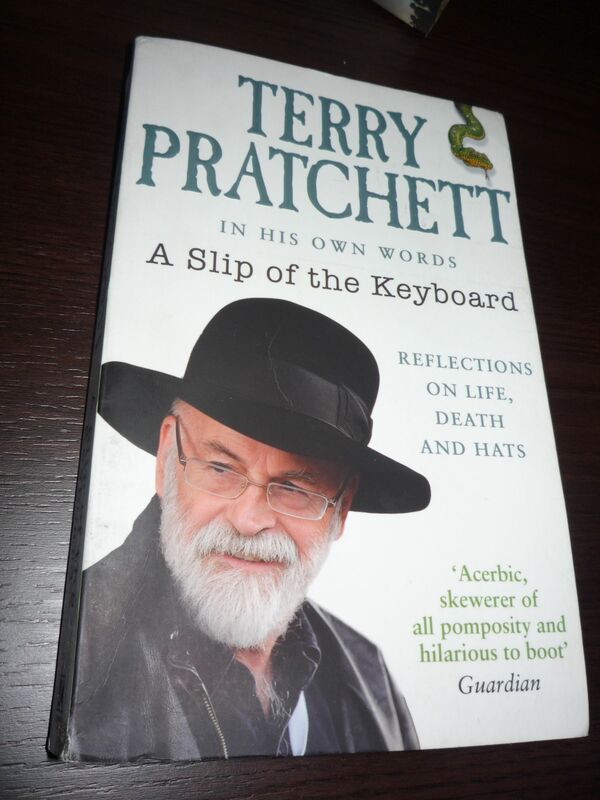 Terry Pratchett is a very special author, one I’ve been reading for over 20 years. I’m now in the middle (at book 16, to be precise) of the systematic re-read of the entire Discworld and I appreciate him even more. They say your life flashes in front of your eyes before you die. This is true. It’s called living. But nobody’s really dead until all the ripples they have created on Earth have completely died away, so as long as my words and my stories are still sploshing around the planet, there’s life in the old dog yet. I really recommend Back in Black to all the Pratchett fans. It made me cry a little, laugh a lot, and swear to read The Carpet People as soon as I finish my re-read. About A Slip of the Keyboard I’ve learned later, after reading Neil Gaiman’s foreword in The Guardian. A brilliant argument that Pratchett isn’t just a writer of funny stories, but predominantly an intelligent observer of the ways our society work. There was a lot of anger behind Terry’s writing, and it’s hard to disregards the satirical aspect of his works. I consider Moist von Lipwig novels to be among the best depictions of the faults of modern capitalism! There are a few dozen short texts here, a bit of autobiography, some trade secrets, some opinion pieces, and, towards the end, more and more on his illness and the approaching death. Nothing that would surprise a careful reader of Discworld, quite a lot to help us understand better where was Pratchett coming from and what he wanted to achieve. I’d give this book to anybody who was dismissive of fantasy, dismissive of humour, dismissive of life as, somehow, overrated, and force them to read it there and then, in front of me, and dare them to maintain their contrary point of view. I think I read this waiting to be convinced that comic fantasy was worth the effort, having expended too much time on inferior exponents. I was totally won over: in TP’s hands comic fantasy is seriously awesome. And I mean that. I just loved this book. I may need to re-read it again at some point soon. I haven’t read any of Pratchett’s books yet, but I do have the first books in his highly-praised universe, as well as the graphic novel adaptation of the first two books. The amount of praise given to the author has definitely given me hope on the quality of his stuff and I really do look forward to reading them for the first time. Your love for the author definitely shines through this post, and I totally understand why’d you be curious to learn more on him as an author/a person. I enjoyed the quotes you shared here, nice review! Pratchett was one of a kind, really. There are many authors out there who imitate him (this being the sincerest form of flattery, according to Wilde) or are at least seriously influenced by him – but none who actually reached his level of wit, humor, sophistication, satire and compassion. I think imitation/inspiration based on an author is definitely the best thing an author could ever see happen. To live to see it too? Wow. I’ve heard several folks mention that about those Discworld novels. I’ve always been keen to check out a series in their publication order no matter what, and since the only ones I have are Sourcery, Equal Rites, Mort and The Light Fantastic, and The Colour of Magic, I might as well start with the latter and see if it’s that “hard” to get into the universe before hunting down a copy of a book I don’t own hahah Thanks for the recc order!